Mercedes' Valtteri Bottas during practice. 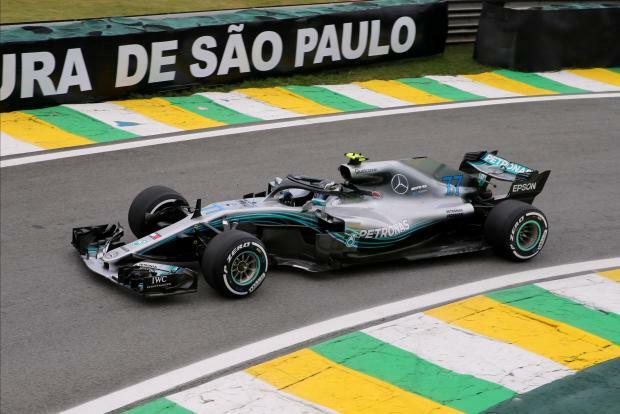 Mercedes returned to the top of the timesheets on Friday in practice for a Brazilian Grand Prix that looks set to deliver them a fifth successive Formula One constructors' world championship. Finland's Valtteri Bottas, who has yet to win in a season dominated by team mate Lewis Hamilton, set the fastest time of one minute 08.846 seconds on an overcast day at Interlagos with a few spots of rain. Hamilton, who clinched his fifth title in Mexico last month with two races to spare and now has five stars on his helmet, was a mere 0.003 slower in a session briefly halted after Renault's Nico Hulkenberg crashed heavily at the tight Juncao left-hander, one of the key bends on the track. Ferrari's Sebastian Vettel was third fastest, 0.073 off the pace after complaining of something loose around his feet, and ahead of the Red Bulls of Australian Daniel Ricciardo and Dutch youngster Max Verstappen. "The car's been OK, but not good yet so still some work to do," said Vettel. "We are in the ball park but I think we can still launch forward from where we are." Mexican Grand Prix winner Max Verstappen had been fastest in the opening session, with a lap of 1:09.011, but was sidelined at the start of the second session as Red Bull worked to fix an oil leak. "They think it's something that might have actually started in Mexico," said team boss Christian Horner. "It compromised his track time but we got enough to get some good data." Verstappen can still become the youngest driver to take a pole position on Saturday, but the 21-year-old played down the chances of that happening. "I had to go a bit too quickly through my programme initially and I had some traffic as well. It's not ideal but I don't think we are going to fight for pole position anyway," he said. Ricciardo will have a five-place grid penalty after the team changed the turbocharger on his car before the start of track action. Horner said it had been damaged in Mexico by a marshal spraying foam on the car after he retired from the race. "It ruined the turbo and the other turbo that Daniel has in his pool was on the engine that failed in Austin," said Horner. "And Renault say that every time they've run a turbo after a failure like that, they usually stop after 400km. "We don't really want to put him in that position." Mercedes will retain the constructors' championship on Sunday if Ferrari fail to outscore them by 13 points. Haas were best of the rest in the morning, with Romain Grosjean and Kevin Magnussen seventh and eighth. The pair were then split by Sauber's Charles Leclerc in the afternoon. Magnussen's car also shed a wing mirror during the session. Antonio Giovinazzi, who will replace Ferrari-bound Leclerc next season, took Marcus Ericsson's car and was 13th fastest in the opening session. British teenager Lando Norris, another 2019 rookie, was also on track in Fernando Alonso's McLaren for the first session and was faster on the quicker soft tyres than the team's departing Belgian Stoffel Vandoorne on mediums. Force India also gave a practice outing to Canadian Nicholas Latifi, who was bottom of the timesheets.